fast, efficient access to low trailers. Aaron-Bradley™ Allied Products and Accessories include a complete line of affordable and industry standard items. Download and print a PDF for inquiring into Aaron-Bradley’s loading dock products and receive a quote. Search all the documents related to the installation, service and warranty of all our products. 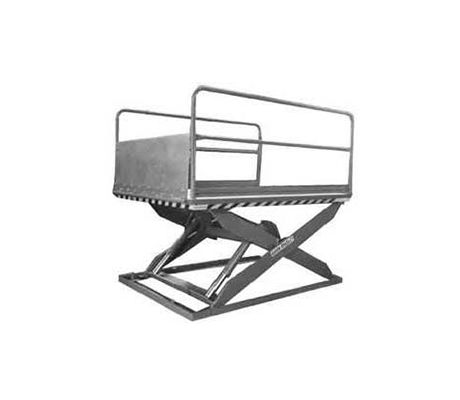 We carry high quality loading dock equipment. Serving our customers with a commons sense approach. We know what it takes for your business to succeed. We’re here to make it easier for you to do business by getting quotes done quickly, delivering quality products at fair and competitive prices and standing behind our name – 100% of the time. We are proud to be a leader in our industry and we encourage you to consider choosing Aaron-Bradley™ when you need loading dock equipment, scissor tables, high speed doors and allied products. Call or email us today. Customer service will always be at the forefront of our business. You are the reason we exist. Technology in the business world seems to separate customers from quality interaction. As a company built on the time-honored ethics of hard work, common sense and personal service, ABC Docks is the company you trust for all your loading dock equipment needs. Our Promise to You: We know you have a choice in your provider of dock equipment, so it is our promise to you that we will serve you as we would our own family. At ABC Docks, you are not just a number. We treat you with the respect, dignity and common sense that you deserve. We welcome your feedback and look forward to working with you. We stand behind our products and you can count on their quality to stand the test of time. The #1 concern every operator has about their loading dock equipment is safety. It’s our #1 concern as well and provide literature that helps keep everyone safe throughout the use of each product. Quality products reduce safety concerns and limit accidents. It’s because we care about our customers that ABC Docks is committed to the safety of you and your crew. Reach a live, friendly person when you need help. Phone systems are so frustrating. That’s why we answer the phone with real people who know their stuff. Get quotes and advice from people who know. The ABC Docks sales staff are the same people who have been talking about and selling loading dock equipment for over 45 years! Get an accurate quote in a timely fashion. Waiting for sales people can mean losing a deal or missing a bid deadline. ABC Docks will get accurate quotes to you in a time frame that meets your needs. When you want the job done right, experience matters. The ABC Docks team has been in the industry for over 45 years combined and can make sure your specs meet the job requirements perfectly. We come to you when the job requires. Want service after the sale? ABC Docks takes care of you and your customers with professional service and even performs on-site visits when the situation calls for it. Every Aaron-Bradley™ product comes with a standard warranty. Don’t be left to the whims of a manufacturer who won’t warranty a faulty product. If something goes wrong, we’ll fix it. That’s what we do. Dealers who succeed run our business. When we can help you succeed, you help us succeed. It’s important that we help you close the deal, install and service the product in a way that encourages repeat business. We’re here to help door dealers succeed. As owner and manufacturer of Aaron-Bradley™ loading dock equipment, ABC Docks, LLC is a leader in the industry. Every day we work with dealers throughout the United States to sell the best equipment at competitive prices, while providing a common sense approach to customer service. Get in touch with us for expert advice and information on the world’s best loading dock equipment.